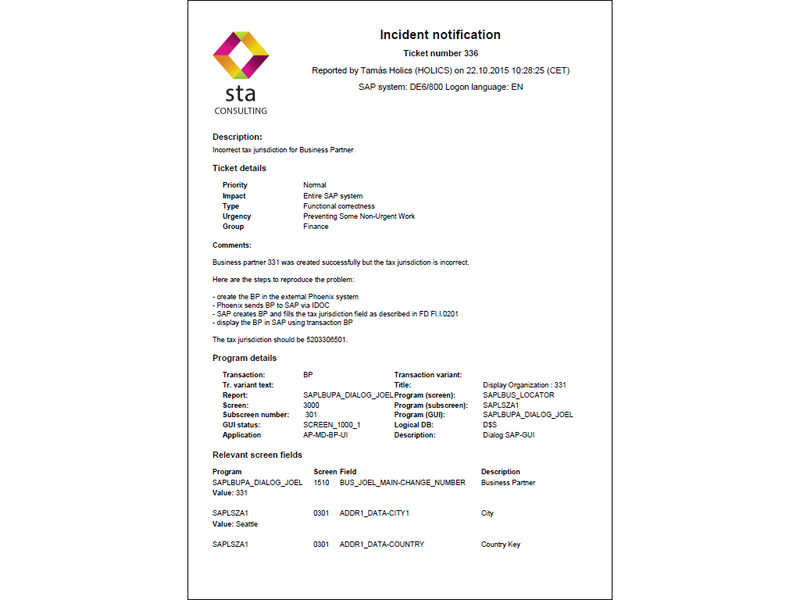 STA SAP Connector is an extension for STA Ticket System, an add-on that allows end-users to create incidents directly in SAP and transfer them to your existing Zendesk system. It includes several handy features to provide very detailed and accurate bug reports. The program can be started from the System menu in the SAP Gui with just a few clicks. 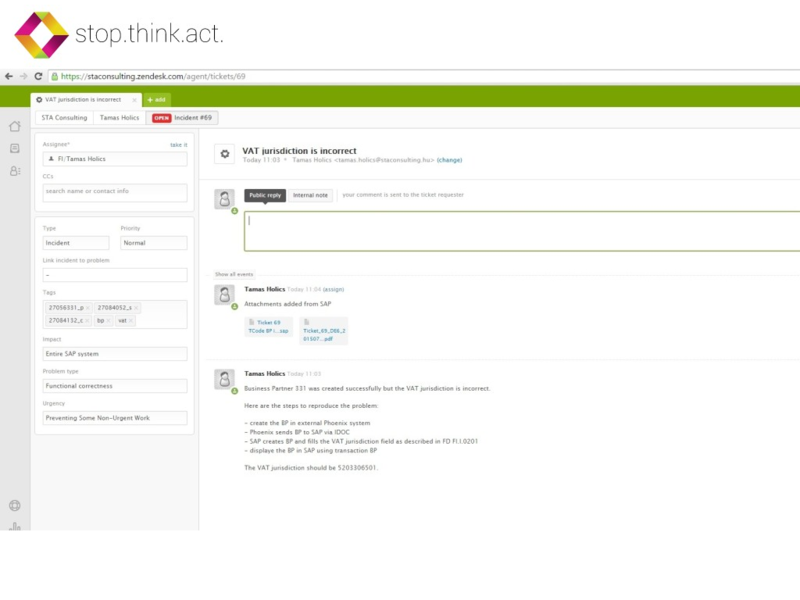 There is no need to open Zendesk in a browser and create the incident manually. Incidents are created using the Zendesk API. You can customize the fields available in SAP to match the ones you have customized in Zendesk. You can implement any kind of business logic on the SAP side using customer Function Modules. All technical runtime information is included automatically in the incidents (system, user and program information) and users can include the business context by adding the values of screen fields to the incident. Having all this information, it will be much easier for developers to find and correct the problem. You can add SAP-specific attachments like short dumps, authorization checks (SU53), shortcuts to transactions and screenshots to incidents. All this information will further reduce the communication overhead between developers and end-users. The program can add all the information to the description of the incident or can generate a PDF or Word document and add it as an attachment to the Zendesk incident. Compliance - an automated view of each incident is available with a comprehensive description of each process, associated data, system state and technical impact. Cost - each incident can be reviewed and decisions taken on remediation without the need for further technical and business input. Time savings - development and testing resources can be managed more effectively with fix and test cycles being considerably reduced. Integration - enhance the quality of error reports in your existing Zendesk system. 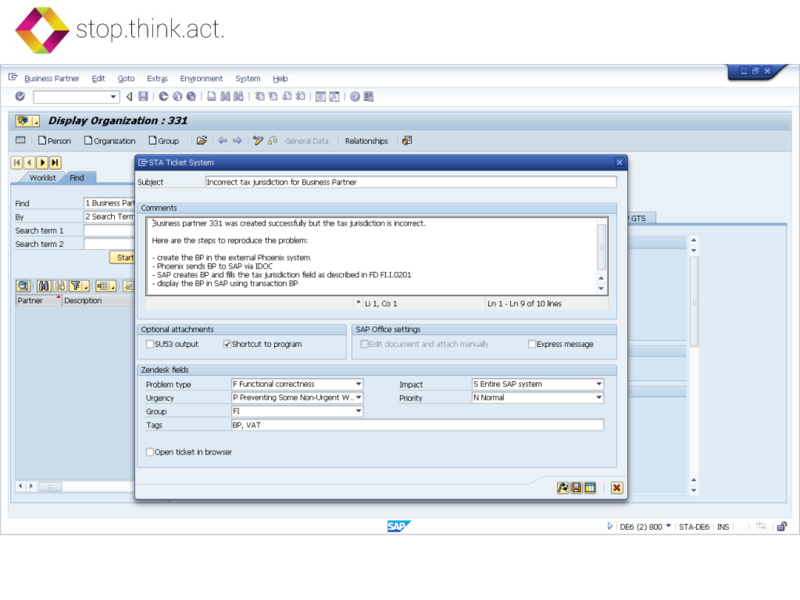 Test the product in your own SAP system without any obligations. Full technical support provided during the evaluation period. The product is an ABAP add-on for SAP systems and can be installed using standard SAP transport files within a few minutes. This product requires SAP Netweaver application server with SAP Basis release 7.00 or higher. No additional components are required for your Zendesk installation. Only the ABAP add-on has to be installed on the SAP system. We include a detailed Installation Guide in the delivery kit together with the transport files and also provide free support during the installation.